This month marks one year that I started on my journey of learning to crack climb. While vacationing in Joshua Tree National Park a year ago, I hired Seth Peitit of Mojave Guides for two days to teach me to crack climb. Not only do I love crack climbing, but I enjoy the process of learning the techniques of crack climbing. Since returning from Joshua Tree NP, I wanted to continue my crack climbing lessons. So every month I drive 70 miles north to Salt Pump Climbing Company in Scarborough, Maine for my lesson with Tino. Tino, the head routesetter, is a "movement guru" and I'm fortunate to take lessons from him. And today I had another super day of lessons with Tino! 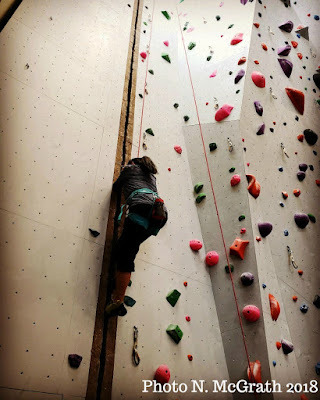 Several months ago I added sport leading to my crack climbing lessons. I find my lessons on sport leading to be really helpful and enjoyable to learn! The lessons give me an understanding and help me get accustomed to the technique necessary in the movement of sport climbing. It includes leading in the 5.6 to 5.8 range and the technique training I come away with has been most invaluable! I got my indoor lead cert from a New Hampshire climbing gym several years ago. In order to do so, I had to demonstrate lead and lead belay on a 5.9 route. I lead up to a 5.10 but most times I felt like I was thrashing my way up a route and didn't see any point in continuing. Discouraged, I stopped climbing indoors for a while and that caused me to lose my mindset and an overall interest in sport leading. Learning climbing techniques with Tino has renewed my interest in sport leading/climbing. For the crack climbing portion of my lesson, I worked on using and alternating tension in my body in order to climb through the pain and pressure. It was nearing the end of my lesson and I was tired, but super stoked to get up part ways of the overhanging section of the crack! On my next lesson, I'll push through the pain and pressure to climb through that overhanging section and to the top! The one factor that I keep in mind in all my lessons is that technique is uber important in crack climbing as in another other style of climbing. This is what keeps my interest piqued. At the end of my lessons, Tino gave me exercises to do to increase my mobility and strength. He also suggested that I keep a climbing journal. So I downloaded the Journey Diary and Journal App, and use that to list all my "light bulb" moments and lesson details to reflect back on.